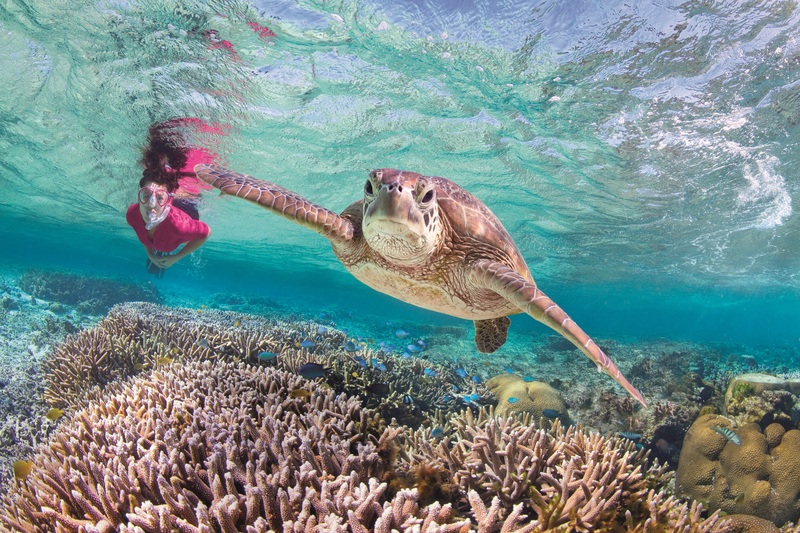 STRETCHING some 2300km long, the Great Barrier Reef is undeniably the destination darling of Queensland's tourism tale. And if you're searching for where reef royalty resides along the world's largest coral reef system, look no further than Bundaberg North Burnett. For it is not only here, that the Southern Great Barrier Reef begins, but where you will find Lady Elliot and Lady Musgrave Islands. For two different reef experiences within easy access of Bundaberg, it's worth checking out these two loyal subjects. Accessible only by small plane, Lady Elliot Island was formed 6000 years ago when the water levels rose to what it is today and a coral reef below the surface began to rise. In 1816, it was named after a ship called Lady Elliot. On this idyllic island made of coral rubble, sand from parrot fish and guano from sea birds, and situated 46 nautical miles north-east of Bundaberg, you'll find the rustic Lady Elliot Island Resort. At any one time, there can be as many as 30,000 pairs of visiting white-capped noddies, which also add nutrients to this tiny 45ha island. And there is plenty of vegetation here too. Octopus bush was the first plant to arrive here and is known for its stabilising properties. It is also home to a tiny forest of eight, 400-year-old Pisonia Trees, which date back to when the island became a coral quay. A ring of casuarina trees, whose leaves are blown in on the wind, also frame this island. In 1969 the first lease was granted on the island to build a resort and today Lady Elliot Island Resort boasts 41 rooms, a Beachfront Dining Room and Beachfront Café. Day trip and longer-stay visitors flock here for more than 1200 species of marine life, including giant manta rays and turtles among some of the most pristine sections of the entire reef. Perched 32 nautical miles from the Town of 1770, Lady Musgrave is accessible by boat and one of the best ways in which to do this is on the Lady Musgrave Experience. This 27-metre, high-speed, three-level luxury catamaran departs from Bundaberg Port Marina in an open ocean journey which takes 2.5 hours before arriving in the calm aqua lagoon. Your Lady Musgrave Experience starts with a tour of the island which was founded in 1803 and named after Sir Anthony Musgrave's wife. Once home to 300 goats placed there to feed stranded sailors, these days you'll find 22 different species of birds, most of them migratory, and salt area trees such as the Pandanus and Pisonis Grandis. Shear water birds migrate off the island around March and April but when on the island, you'll find their nests everywhere like pot holes and hear their distinct cries which used to scare sailors as they sound something between a murder victim and a wailing baby. The Black Noddy Tern nests in the trees and returns to the same tree each year and you'll see sea turtle nests in the sand here too. Visitors are allowed to camp here for up to 21 days at a time. This day-tour experience also includes a Glass Bottom Boat Tour where you will glide over coral gardens, have different varieties of coral and fish explained to you, and if you're lucky, witness a turtle cleaning station where fish pick the parasites off of the turtles. Afterwards, snorkel among some of the finest coral the Great Barrier Reef has to offer while harmless reef sharks circle below you. • Bring a sense of wonder and curiosity, you are experiencing the world's largest living reef!